Estate Planning: What You Need to Know (NYT) | The Levin Law Firm - Philip Levin, Esq. New York Times: This article on the importance of estate planning starts with ” not discussing something that is going to happen will not stop it from happening. 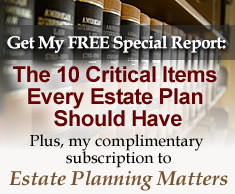 And at some point, someone is going to have to sort out your estate — regardless of how big or small it is.” The article then summarizes key estate planning issues that should be addressed.